Opportunities for Ministry Some feel a calling from within their soul to serve God and humanity in this life. Andrew began learning meditation in high school and was an avid seeker of spiritual knowledge throughout his twenties. He attended many lectures, workshops and retreats in search of answers to questions such as… What is a human being capable of? Can I know my soul? What does it mean to be in relationship with God? For years he tried various techniques such as Out of Body Travel, Lucid Dreaming and Psychic Readings. While living in the Bay Area in California in the mid 90’s, Andrew studied at the Berkeley Psychic Institute developing his ability to read energy. This led to years of providing Tarot Card readings for friends and eventually for clients. In 2004, Andrew met Master Teachers and Priests of a Mystical Christian Order which had several Centers throughout the US. He was living in San Francisco and the Center of Light was in Oakland. He was baptized into the Body of Christ in the summer of 2004 and became a devoted follower of Christian Mysticism. In 2005, Andrew became a novice and lived in the community house allowing himself to be taught and trained for ministry. The focus of the training included daily meditation and Communion, learning the Christian Mysteries, contemplating the Gospels and in essence, learning how to truly love God and all people. Andrew was ordained a Deacon in Feb. 2006 serving the Oakland community alongside the Priests in the Oakland Center of Light. He moved to Chicago in 2008 and began training for the Priesthood where he taught meditation classes and other spiritual classes at the new Chicago Center of Light. In May, 2013 Andrew was ordained a Priest under the mantle of the Holy Order of the Golden Cross. The ordination was performed by two Master Teachers of the Holy Order of MANS with the ceremony being held in Marin County, CA in the city of Corte Madera. Shortly after his ordination, Andrew opened Meditate Yoga and Meditation Center in Chicago teaching meditation courses. He hired yoga teachers to provide quality yoga classes that focused more on the spiritual approach to yoga and less on the sheer athletic side. Meditate was a success in many ways. It introduced Chicago to the contemplative style of meditation that Andrew had learned through his training and in addition, it served to draw souls who wanted to explore the mystical path. 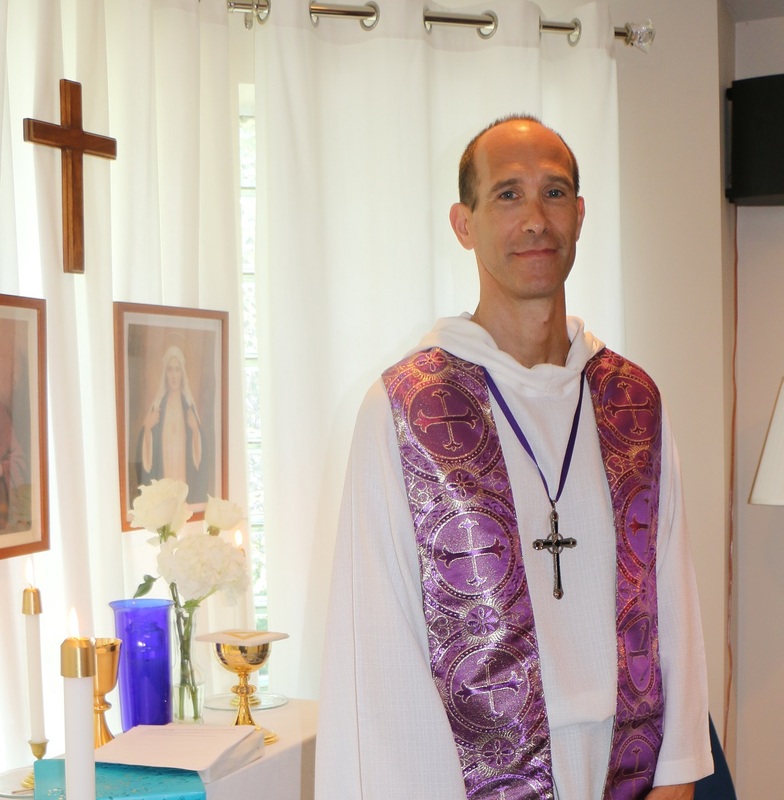 In addition to the meditation center and building the Mystical Church, Andrew volunteered with several organizations including Prison Fellowship where he taught Transformed Life Classes to inmates at Pontiac and Stateville Correctional facilities for 4 years. Andrew also taught English as a second language through St. Joseph’s Services and took on a ‘little brother’ through Mercy Homes for Boys. The Mystical Church of Christ began holding Tuesday evening bible classes and Sunday Services even before Meditate opened in the summer of 2013. A few people Andrew met in Chicago would congregate at his home in Lincoln Square for bible classes, Wisdom School classes and to meditate and receive Communion. One student was even baptized there! With the meditation space available to hold Mystical Church classes and functions, a community began to gather. Over the 4 years that meditate was open, several dozen people attended classes and Services at the Mystical Church resulting in a strong community foundation and even an ordained Deacon (Naomi Brostrom)! In early 2015, Andrew began training towards another ordination, that of Mastery. For 3.5 years, Andrew met with and communicated weekly with other more advanced Teachers to prepare him for greater service to God. His Teacher, Rt. Rev. Mara Sophia informed him in the spring of 2018 that she had received Guidance to ordain him into Mastery that summer. On June 30, 2018, Andrew was ordained in Chicago. In January of 2018, Andrew moved to Charleston to begin a new Mystical Church of Christ community in South Carolina. He opened Meditate A Center for Healing Arts in West Ashley and began teaching meditation classes as he did in Chicago. This time though, no yoga!